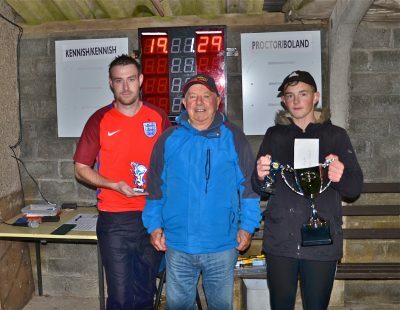 The Manx Petroleum sponsored Outdoor Winter League returned this weekend with eight of the twelve teams in action across the weekend. Last years champions Mooragh Lakers start the season as favourites but I think they will be pushed all the way by Seven-Up and Jacks Off. Seven-Up have finished second in the last four seasons just not finding enough in the tank to reach the top. Jacks Off (last year Unstopabowls) will hunt a record ninth title having last won the league last back in 2016. My prediction is for those teams to make up the top three but each team has the potential to be champions come March; it will be interesting to see how the season unfolds. Onto the action and Saturday saw Erin Porters get their season off to a great start beating Bits n Bobs 119-81 and 5-1 on games. Mavis Franks and Alan Kennaugh won to single figures with Gill Morgan picking up Bits n Bobs sole win. Champions Mooragh Lakers started their defence with a 117-94 (4-2) victory over Bowl Rollers. Result of the match was Alan Moore and Brian Kelly winning 21-7 against Shirley Whelan and Gordon Corrin in the doubles. Bowl Rollers were ruthless in their second match claiming the first white-wash of the season defeating Bits n Bobs 126-81 (6-0) with Sylvia Kennaugh and Lil Smith winning to single figures. Mooragh Lakers showed all the qualities of being current champions by defeating Erin Porters 123-99 (5-1). Wayne Roberts beat last years merit runner up Jenny Moore 21-18 to claim Porters only win. On Sunday another four teams came to Nobles Park to square up. Jacks Off, Louies Angels, Castletown Corkers and Govags. Govags in their first match defeated Corkers 111-93 (4-2). Kevan Osborne (Corkers) won to single figures and Pat Robertson (Govags) nearly pulled off a comeback against Nathan Hamilton just losing 21-19. Jacks Off faced Louies Angels in their first match and won by a convincing 120-81 (5-1). Austin Hart and Steve Waters won 21-10 in the doubles game against Thomas Keggen and Trish Bull. The only win for Louies Angels came from their new captain Alison Keggen who made sure there was no whitewash on the cards defeating Dave ‘Dido’ Kelly 21-15. Louies Angels quickly forgot about their opening loss by defeating Govags 123-92 (5-1). Margaret Tasker and Ken Karran winning 21-9 in the doubles; Peter Kelly picked up Govags only win beating Debbie Leece 21-18. Jacks Off picked up another big win in their second match winning 124-81 (5-1) against Castletown Corkers. Alan Moore had the best singles score winning 21-10 against Kevan Osborne. Nathan Hamilton picked up his second win of the afternoon and prevented a whitewash winning 21-19. Looking ahead to next weekend Outsides, Parkers, Seven-Up and Castletown Cannons all play their first set of matches on Saturday. Sunday’s game of the day see’s Champions Mooragh Lakers play Louies Angels. Marown Bowling Club held an end of season Floodlit competition, hosting the inaugural Juan Kelly Cup, with the format being an any competition doubles, played over 15 ends with ends 5, 10 and 15 played as ‘power’ ends with the points scored counting double. The pairs were given a handicap based on their rankings in the Men’s and Ladies game. If scores were tied after 15 ends a one bowl shootout would take place, with a player from each team nominated to play the deciding end. The competition in this format, attracted a bumper entry of 40 pairs, with some interesting pairings making use of the handicap system played over two qualifying nights, with four pairs qualifying from each night for the quarter finals. 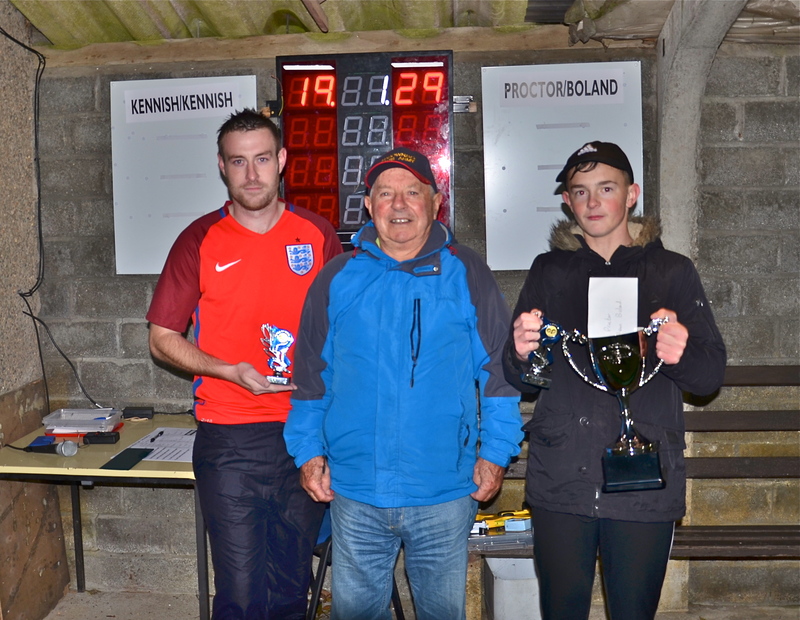 The eventual winners were the pairing of David Proctor and Glenn Boland, who mastered the extremely wet conditions, defeating Bethany and John Kennish in the final to a 29-19 score line. Proctor and Boland were superb throughout the whole competition, winning all of their games to comfortable scores. Losing out in the semi-finals were Clare Cooper and Rebecca Teare 20-22 to the runners up, along with Kim Hargraves and Stefan Kelly 19-27 to the winners. Losing quarter finalists were Dave Pease and Steve Cook, Thomas Keggen and Dave McCabe, Jenny Moore and James Teare, Lil Smith and Maureen Payne. At the conclusion of play the presentation was made by Phil Kelly, who thanked Juan Kelly for sponsoring the competition, the Ladies for the refreshments, the players for entering, and all those who stayed to support. Juan Kelly then presented the prizes. Spot prizes were also given for highest score in the first round, which also went to David Proctor and Glenn Boland, (37 points) with the biggest break being awarded to Fiona Kennish and Alan Moore (15 points) Credit must also be given to Marown for trying something different, with the excellent entry showing the support for the new format.